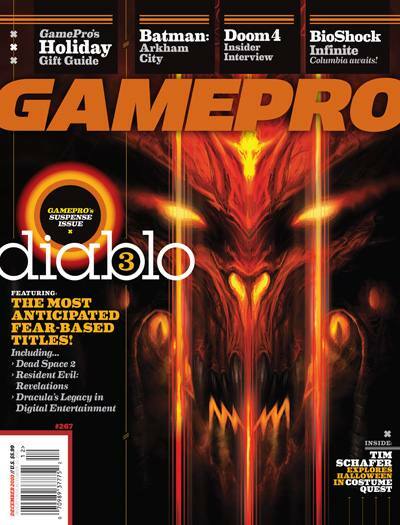 If you can get your hands on the new issue of GamePro magazine (#267, December 2010 with Diablo 3 on the cover), check out my article on the psychology of horror. The timing with Halloween was better a week or so ago when the issue first came out. This is another one of those topics that I was unsure of when the editor at GamePro asked me to tackle it. Not only did I not t really know much about the topic, I’m not even a fan of horror movies or games in particular. I’ve never seen a Saw movie or any other “gore pr0n” in my life, nor do I want to. Still, that’s why they call it “research” so I hit the library and found some more informed experts in the fields of psychology, media studies, and communications to help fill in the blanks. I got some great material, and the article turned out to be a lot of fun to write. This is the issue to look for if you want to read the article. Other explanations for the appeal of horror are cited, plus I also ruminate on what the research tells us about scary video games in particular. I really don’t have any feedback on how well these GamePro pieces are being received, so if you’re reading them, post a comment and tell me what you think. Did your research lead you to the Thinking After Dark issue of Loading (the Canadian academic journal of digital games)? That entire issue consisted of papers about horror games. Good stuff if you didn’t come across it. And definitely looking forward to the piece. Wow, no I wish I had found that. Looks like some great stuff. Bookmarked and set aside for reading. Thanks for the link! Your blog is not necessarily a source of comedy for me, but the Bobo bit made me laugh out loud. I don’t get GamePro here, is the article online anywhere? @Bronte Not at the moment. GamePro seems to publish some of its features on the website a few months after the print magazine, though, so maybe it’ll be on the ‘net then. I’ll certainly post a link on the blog if so. I’m not being snarky here – just curious. Neat, this story got slashdotted.